Asking people to “look at the damn sky” isn’t much good if they don’t know what they’re looking at. It’s easy to assume everyone can find the big dipper or locate the North Star. 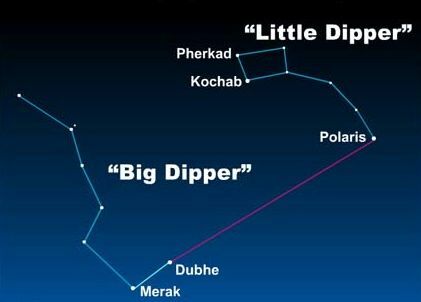 In the spirit of “baby steps” – everything you ever needed to know about finding the “dippers” and locating Polaris, the North Star. The Big Dipper is always found in the north sky – in spring and summer, high in the sky – fall and winter, close to the horizon. Made up of seven stars forming a bowl and handle, the two outside stars of the bowl are Dubhe and Marek – the “pointer stars” leading to Polaris and the Little Dipper. Follow them in a straight line and Polaris is always there – a cosmic anchor for “dippers” making a complete circle of the north star every 23 hours and 56 minutes. No matter what time of year you look, the two outer stars in the Big Dipper’s bowl always point to Polaris. Polaris may not be the brightest star in the sky – ranking 50th is inconsequential to a stellar constant above the “celestial north pole”. A star of many names; pole, north, steadfast, lodestar, guiding; a fixed point in the sky responsible for navigation of the ancient world. A gift of cosmic confidence powerful enough to sail into the unknown, the only GPS northern hemisphere travellers needed to find their way home. A beacon of hope for American slaves heading north to freedom – and once you know how to find it, a way back to the car when you’re lost in the woods.